So - today is going to be Thanksgiving for my little family. We actually celebrated last Sunday with my in-laws, and then Landon and I went to Chuck-A-Rama for Thanksgiving since we both worked. It actually worked out really well, because we get Thanksgiving 3 times in one week! And I'm not even sick of it. So even though I'm a little late, I am going to post an amazing recipe for stuffing that we are going to have for dinner tonight! Question. Why do they call stuffing 'dressing'? And Miracle Whip 'salad dressing'? I am confused by all of this, and when people call these things by their alternate names I am picturing Ranch for both items. Is anyone with me?? So, in case you are wondering where I have been for what seems like forever, well - I was kitchenless for the majority of this week and last. You see, my house was tore up from the floor up - literally! We went on "vacation" a couple of weeks back, and that started a whole slew of projects. The husband and I really have a hard time relaxing, so we spent the majority of our vacation painting our house. Which led to days of painting/2-toning/touching up. This led to us wanting to get our hardwood floors redone - which led to everything crammed into the kitchen while the 3-day floor refinishing project begun. This led to our house being unlivable there for a couple of days - man, that stain is STRONG! And the projects continue on. Today my hubs and father-in-law are putting up new baseboards, while my 'Thanksgiving' dinner is cooking away. Whew, it makes me tired just thinking of our last few weeks. I will post pics when the transformation is complete! 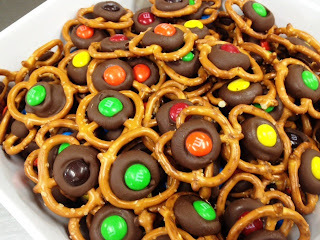 These cute little chocolate pretzel bites I found on Pinterest, and naturally was dying to try. *WARNING* do not leave in the oven for more than 1.5 minutes. I am being serious right now. The first batch I made I left in for about 3-4 minutes, and the chocolate hardened right up and fell all apart. It was a sad moment. Seriously, 1.5 minutes MAX and you are good to go! On the picture on Pinterest they used round pretzels. I am probably just blind, but I couldn't find them anywhere. So I settled on normal pretzels, and although they didn't look as perfect, they still turned out cute, and most importantly YUMMY! I am so deeply in love with these cupcakes that it is almost a problem. Although I have not made them more than once (yet), I have a feeling that these are going to be in my life for the long haul. 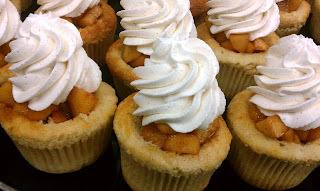 I want to make more apple, some cherry, mixed berry, well basically any kind of flavor that would normally be a pie, then make it into a cupcake! They turned out so dang cute, and they tasted even better! But grab a fork people, because this is no eat-and-go dessert. Unless you want to skimp on the filling, and if you do that then shame on you! The recipe called for a vanilla buttercream frosting, but I am sorry but I HAVE to have whipped topping on my "pie"! So instead I made some homemade spiced whipped cream, and you will notice some little specks in the picture. That is cinnamon people! Someone told me that they are going to buy me an industrial sized container of cinnamon for Christmas because I use it so much. Although she was kidding, I didn't think it was a bad idea :). Well, the other day I had to part with my beautiful HTC Evo. You see, since we moved to our new house my phone seldomly worked from my place of residence, and it's never worked from the house we stay in St.George or the in-laws cabin. So today I got the iPhone 4s from Verizon, which is where I am blogging from currently! At the house in St. George! Score! I still love my Evo and it will be greatly missed, but I must say that it is nice to receive phone calls on the couch. I am much too lazy to go outside in the corner of the lot in order to conversate (yes, spell checker is telling me this isn't a word - but it is now. Take that spell checker!) with people. So on Sunday I turned 25. Scary huh. This was the first year where I didn't get the least bit excited that it was my birthday. I wasn't depressed about it, but it truly felt like just another day. The first sign that I am getting old. Now that is depressing. For my big quarter-of-a-century day, the hubs gave me a gift certificate to Williams Sonoma (he is so good to me! ), and one of the treasures I purchased was a bundt pan. I love it, LOVE it! So I made my own birthday cake! 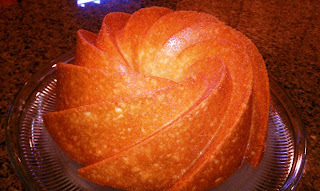 I decided on a lemon bundt cake, and I am telling you right now that it was simply AMAZING! We served it with some french vanilla ice cream, and I ate two enormous pieces. And secretly could have eaten more! I am currently planning the next time I can make this beauty again. Maybe tomorrow... :) So here she is! Back in the day I would make a chocolate trifle in my trifle bowl with chocolate cake, pudding and whipped cream (not homemade at that point. I wasn't that fancy when I was 15). It was one of my favorites that I made on several occasions. Awhile back I needed a dessert for one of the sports banquets that was being held for the students, and I wanted something that looked fancy, tasted great, and wouldn't take me all day. 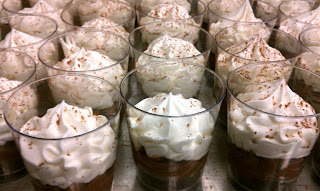 I decided to try and make some little individual chocolate trifles! I wanted to be able to cut a little circle into the cake to put in the bottom of my little glass, but just knew that any old chocolate cake would probably fall apart the minute I tried to take the circle out of the pan. Then it dawned on me. Sponge cake! Honestly, I had never made sponge cake in my life, but it just HAD to stay together. It's like sponge - right?? Well, the end of this story ends fabulously, and my sponge cake came right out of the pan just as expected! The day of the banquet was the day that I went to Taylor Swift, and I had to leave early and was so stressed that I was leaving everyone hanging that I didn't even remember to try a trifle for myself, but I heard that they were very delicious! And I just loved the presentation!